I've booked another one. The latest date I could book at Snetterton before the seasonal price increase. But hopefully late enough for mild weather (dammit, that's cursed it). Details here: https://www.msvtrackdays.com/car/calend ... rch/25-sn/, but don't book online! GROUP BOOKING ARRANGEMENTS NOW IN PLACE! 10% off prices below on anything you book via the MSV booking number; 0843 4533000, quoting the Group Booking Code. You'll need to provide your credit card details, which won't be billed until later (typically about 10 days before the event). Plenty of room for newcomers to trackdays too, we do our very best to look after everyone and show you the ropes. Light refreshment services also included for free in our garages. 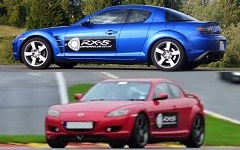 If you've not driven an RX-8 on track before, you should try it at least once during your ownership! If you'd like to stay for a meal afterwards (and avoid the rush hour traffic!) we usually book a table at this pub A lovely, cosy place that does good food, less than 10 minutes from the track on the way back down the A11 (where most people will be heading). Simple let us know and we can book a suitably sized table. Noise limit is 105dB(A) static and 92dB(A) drive-by. I was looking at this event a couple of days ago! Fits OK in my diary. Last edited by New Duke on Thu Jan 24, 2019 3:30 am, edited 1 time in total. Referring to the Snetterton day, would this be suitable to come along to with a friend, with the intention that we share the driving? Or does it require only one driver per car? Pencil me in for this, should be able to schedule this into my diary. Extra drivers are not a problem, the additional driver has to pay an additional fee though. I can't see that stated fee anywhere at the moment, but typically between £25 and £40, can be paid on the day (EDIT: £30 for an extra driver, less 10% if done on a Group Booking, see next post). I can confirm that I'm in for this! I shall be booking track+extra driver+two helmets+one tuition session. Has the 10% discount expired yet? I'm interested. Will be booking on Monday when the lines are open. The car needs a shake down before I go to the Ring in April to check for any gremlins. Malcolm, did you manage to arrange any garages too? We'll get some Free garages with the group booking. Should be enough. I have finally got around to calling up and booking! I've left my card details with them which will be billed nearer to the time, with or without the discount depending on whether the group fills up. In case anyone was wondering, I can confirm that the £129 is still applicable (for some reason, I thought it was supposed to go up over time). For the sake of the first post, I'm Mike and I'll be in an S1. Ah, that looks great, I would have loved to! However, I have a commitment back in Ipswich that evening. Next time! because of relocation will not be able to make this now. I have a neighbour with a new (to him) first generation Z4 who may well be interested in giving a track day a shot. Since we appear to be two places away from the discount, would you like me to invite him?